Wrap your baby in ultimate luxury with our Dono&Dono Bamboo Cuddle Blanket. Made from 100% rayon from Bamboo, an eco-friendly fabric that is naturally silky soft, breathable, and antibacterial, making it ideal for babies with sensitive skin. A lightweight and breathable fabric, Bamboo will help keep your baby cool on warm summer days. The Bamboo fiber is naturally hypo-allergenic, deodorizing, highly absorbent, and helps to block out harmful UV rays. Our multi-functional Bamboo Blanket can be used as a swaddle, stroller or car seat cover, or a nursing cover for moms. Dono&Dono products all feature high-contrasting black and white designs, great for baby’s developing eyesight and is proven to boost brain development. Blanket measures 41” x 41”. Washing instructions: Machine wash cold, gentle cycle. Air dry. Do not bleach. Do not iron. Made in South Korea. ULTRA FEATHERWEIGHT SWADDLE - Bamboo fibers are super soft and gentle against baby's sensitive skin, and even more durable than cotton! Wrap your baby in ultra softness that is lightweight and cool to the touch. LIGHT & BREATHABLE - Rayon from Bamboo helps babies stay cool in hot summer months and provides airy protection from direct sun light. Our versatile blanket is great for sunny summer walks in the stroller or as a lightweight nursing privacy cover. EXCLUSIVE DONO&DONO DESIGNS - Dono&Dono products all feature high-contrasting black and white designs, great for baby’s developing eyesight and is proven to boost brain development. Our Bamboo Blankets make great tummy time mats for infants too! NATURALLY ANTI-BACTERIAL - Bamboo fibers are naturally antibacterial, moisture wicking, and breathable. 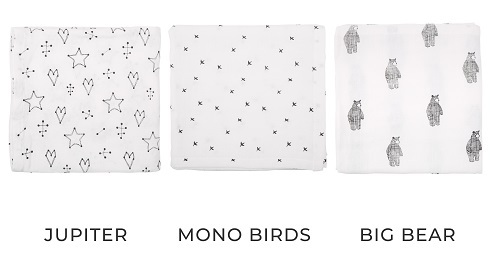 Bonus, all of our Dono&Dono unisex prints are non-irritating and soft against baby's skin making our blankets ideal for babies with eczema and other skin irritations. MULTI PURPOSE BLANKET - Generously sized 41" x 41" blanket can be used as a swaddler, nursery blanket, lovey security blanket, stroller blanket, and much more! All of our Dono&Dono products make great baby shower registry gifts for newborn essentials.